Capt Bones, Miss Lynn, Capt Bumpkin and Sheena the Warrior Princess embark upon a new boat construction adventure located at a top secret (code name only) location past the far side of beyond. We look forward to sharing our build efforts as we convey them in pictures and words that will also likely be reflective of our success and failures along a wide continuum of emotions throughout our work. We have pick-up our cut kit and returned to our secret location, code named GoatHead Ranch ten miles from the Tennessee River. We have opened the box scatter bits and pieces all around us, then froze in the sudden realization of "WHAT HAVE WE GOTTEN INTO NOW! We figure after two or three days of hard drinking, as pirates are wont to do, we will shed our fear and pick up the some pieces and glue them together. This reminds me of a story. Several years ago I acquire a MT 49 PH that the Bahamian Government had taken from a drug smuggler and tried to use in chasing down other pirates. In short order, I think, they figured out this seven knot boat would not catch much. Heck, they have tidal bores twice as fast as this trawler was. Well I put it on the hard with much refitting and repairs to get done, so much and so many I couldn't figure out where to start. A friend came by and listened to my tale of woe as we were standing on the flybridge deck, my phone rang, I answered it and was talking with my wife when I heard a small engine sound behind me. I turned to see my friend Jesse, dipped the churning blades of a chain saw into the boat and cut off the back third of the flybridge deck. He turned off the saw, turned, dusted of his hands and said. "There now you have a place to start." I certainly did. Well, Capt Bumpkin isn't Jesse, but he is a bit more aggressive. which is tempered by the fact he has a full time job and lives fifty miles away. Pity me, when he gets time to help me build. Been working for a couple of weeks now using a combination of assembly procedures, U-tube and the periodic phone call to Alan. Hopefully this report with pictures will show up properly on the site as a test. It appears that you are making very good progress. It actually looks like a boat. LOL. Dale. Yes! The blooming of this boat shape from messy flat wood pieces glued together is intoxicating. The fact it all comes together rather perfectly like a hardwood origami creature is rewarding and exciting--most here already understand this feeling. Now I do also. I am pleased. Now it is time to get to work. Welcome to the forum; looking forward to following your build. Thank you, look forward to sharing and learning from others. I have a small bit of tweaking to do to pull a small crack out of the chime/hull interface near the bows. My next step is to install the temporary batten along the top edge of the side panels. At the moment, the forward bulkhead is a little sloppy and the #2 bulkhead a little tight but those will be adjusted for proper dry fit after the batten. After checking for twist, I am electing to tack weld the chime and keel bottom and then the interior keel fillet from stem to stern prior to setting Bulkhead #1 and #2, the transom, and hanging knees. After that...will see what's on Alan's next page. Probably gluing up more cleats on pieces of pretty wood. Welcome to the crazy (international) world of boat-building pirates. The Coresound series will not disappoint your penchant for adventure. This forum is a great place to pirate (err, share) ideas from other builders, so looking forward to reading about your adventures. Regards, Drew (a great south land pirate). Aaaarrrggggh! Thank you Drew. After an unexpected lay day--back to the boat barn where thar be dragons to slay. We're all here for ya if you have any needs or questions, but it looks like you have it under control so far. Chick, Thank you. Our first year of full time cruising we spent several weeks off and on over a summer on Tellico and The Little. It indeed is a magical place. We retired from cruising and started a goat farm ten miles from the intersection of Mississippi, Alabama and Tennessee which is a point in the middle of Pickwick Lake. I developed an interest in adventure challenges, bought a Hobie AI, used it, sold it when "My Precious" said, its challenges or the goats not both. And because I got lost in my own mind with hallucinations and the Everglades at the same time she added the caveat of no more small boats that you sit on like the Tri. You can have any boat you want as long as it is dryer and you can sleep on it. Now who am I to argue with a woman who says I can have a Core Sound? Well, the goats are gone and the Core Sound is in my barn with the hull keel fiberglassed with 12oz 10" cloth and this morning going to fit the bulkheads, and transom and tab them in and whatever my next directions say. (Its morning and sometimes I forget what I read yesterday until I see it again in the morning). I do not and likely will not day sail or cruise this boat. It is being specifically built for Adventure Challenges. Once complete however, it will spend plenty of time on the lake and river being tested, learning its skills and disabilities, figuring out the best way to sail a Cat-Ketch and in general blending with the boat. I have a hard time going out just to sail--it seems I need a hard purpose, a definitive goal. I suspect my favorite place is the waterfall cove at Pickwick Lake or the first lake south on the Tombigbee Waterway at the end of the canal or ditch, who's name is not jumping to mind. We look forward to your building adventure, and then, your Adventure Challenges. I feel uncomfortable not knowing what I am doing building this boat. Being such a novice, I have little feel yet for what is a good technique or a bad one or what step should follow the next. I am using B&B’s freshly written build or assembly instructions for the 17 MK 3. Fortunately the pages I have used to date are exceptional in clarity. I know this because I followed the directions closely and every joint on the boat, with a push here and nudge there and with a twist of wire or a screw and pad, lines up perfectly and the boat is not out of rack. The upper bow has pulled apart a bit but that came together nicely when I did as Alan suggested and wired the stem with more wire and wire the 1x2 shaper board bow ends together. This pulled the gap on the stem totally closed correctly without any odd deformation. To date the forward bulkhead, 2nd bulkhead and the standing knees have been dry fitted, taken out, the epoxy and glass keel strip run from stem to stern, the bulkheads and standing knees dry fitted again then glassed in place. To their credit Alan of B & B has been with me and supportive every step of the way as needed. 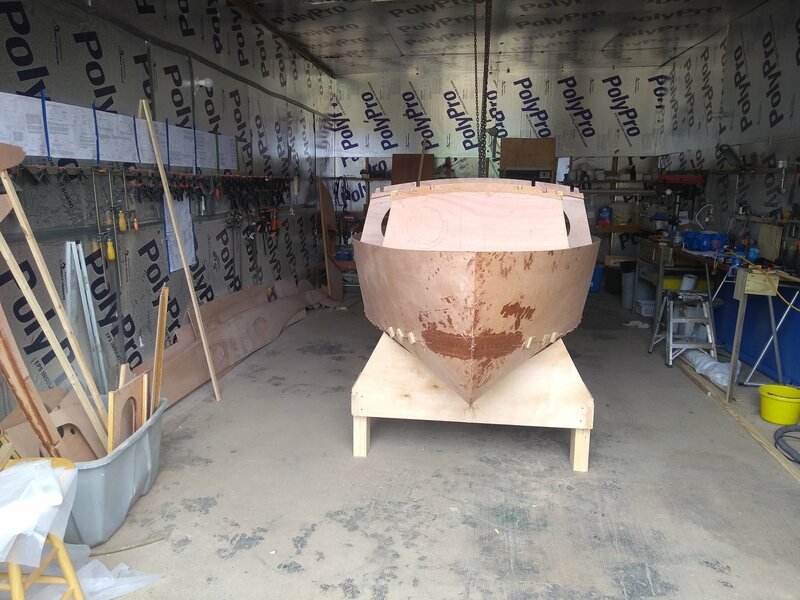 With the keel glass complete, the transom wired in place and fiberglassed as directed, the bulkheads and knees glassed in place as well as the standing knees—I am turning to the next page of the build. Before I do, I wish to thank all of the list members who have graciously shared their building experience. I have read each Core Sound build on this list multiple times and watched the videos. Honestly, I am not sure how any of you had the time or energy to write and take pictures during or at the end of the day. It seems the buildout of # 14 in some areas is ordered differently then previous builds, so I will attempt to share my experience with better coverage in the future--and more photos. The first question I would ask a new builder before they began would be: "Will you enjoy the process of building and the steep learning curve?" The answer to this must be "YES". But if it is, you will have a blast, as you have found out. If you have the patience, between B&B people and this forum, you will get the help you need. Just to add a little more confusion. Captain Bones is building the CS17 mk3.2. We have totally redrawn the mk3 17 and 20. The lower hull shape has not changed and the bulkhead positions have not changed but there have been a lot of subtle changes in much of the rest of the boat. This is why they are freshly written instructions as we try to keep them as up to date as the plans. We continually try to optimise our boats and I will try to find the time to explain all of the changes in a new string. Actually, to my way of thinking, hull # 14 is the Core Sound 17 MK3.Bones. What with all the ideas and effort to constantly make an excellent vessel better I suppose the designer does reserve the right to label it .2. However, it remains Bones to me, my very own B & B custom design CS17, kinda. Thank you Graham and Alan. It is an amazing boat to sail regardless of revision and or sailing conditions. Keep that in mind as you go along. It has exceeded our expectations by along way. OK. I will. Thank you for your comments. Good news: I found a full 2"x8"x12' dried Cypress plank locally that I will use for sprits. I have two nice plugs ripped out of it and may be able to get a third as a spare. Dem wild plug things will be tamed into sprits Friday afternoon or Saturday morning. Glad that's solved, it took two full days to run down decent wood of any kind, other then plain ol Southern Pine. That's how it is when you live in the far side of beyond. Interior chines are filleted and glassed. Guessing its ok to do the transom also. The rudder blade is glassed and coated twice more on one side. Doing the other side either tonight or early in the morning. it will be completed, except for finish sanding and paint, until I figure out trim colors for the boat down the road. Alan is feverishly working to finish the next segment of plan sheets this week while most likely juggling a few other projects. I appreciate the way Alan has stood by me in this build. Capt Bones sir, it sounds like you are already on an adventure challenge, whatever that is! Please define adventure challenge. Oy mate. I am sure you have similar events in your country. Here they are small boat events to test yourself, well, against yourself, nature & time. A proper set of challenges right now are the WaterTribe Challenges with the Everglades Challenge, a 300 mile event, being the most popular. B&B makes reference to them on their website and both Graham and Alan are heavy hitters in the events as well as their Core Sound boats. Another popular event is the Race to Alaska, (R2AK). You would be well served to google both those events and WaterTribe for the best descriptions, much better then I can provide. I have not completed the EC and wrote about my adventure but it is probably not appropriate for this forum due to its off-content and length. I have a score to settle with the EC and am looking for redemption in this boat. We have one or two similar challenges, although a bit less challenging than the EC. One that comes to mind is the Marlay Point overnight race. The trouble is that people have become so safety conscious and risk averse that the boat has to comply with Cat5 Safety standards, be crewed by two or more and preferably have a Class Based Handicap, which I have found difficult to get for my Coresound 20. Most of our sailing here is in open ocean, so small boats are a bit limited for distance sailing. Keep up the build posts, your reports are interesting to read. By the way, I increased my cabin length and decreased my cockpit size for that very reason, to make it more suitable if and when I find myself in rough water as well as to provide additional cabin space for a small galley etc.